Dorsum Oppel is a wrinkle ridge of the Moon in Mare Crisium. 2 days after full moon is the best moment to observe it. It is a very large formation and the landscape along is quite impressive, full of small craters, tiny mountains and the smooth floor of Mare Crisium. It is important to reach a high magnification to enjoy the view (150x at least). My setup is a 6-inch telescope, but I bet it is possible to observe it comfortably with a 4-inch refractor. 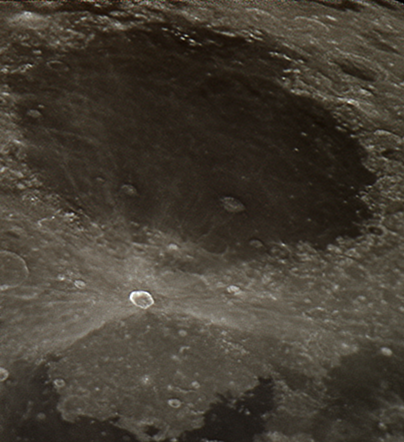 The bright and overexposed crater is Proclus. I have to work harder the dynamic range issue next time. Two days after full moon Mare Crisium shows a nice landscape of mountains and shadows. Some of its inner crates are visible in this picture. The small crater Swift is on the limit of visibility. The big impact called Proclus and its rays are remarkable. To take this image I used the Canon EOS 450d, Rebel XTI DSLR camera recording video subframes and later I stacked them up with Registax 5. Some small tweaks on Paint Shop Pro 9 and ready. Stacked from a video under Registax 5 and stitched with Autostitch, I got yesterday this Moon mosaic. Equipment: Meade Lightbridge 16″ and Casio Exilim EX-FS10.